For more than 20 years of my life, I had no satellite TV to watch. Day by day, I had to suffer with basic free television network; TV1, TV2, TV3, NTV7, 8TV and one of my favourite channels as a child, Channel 4. I have always envy those who had Astro when they were young. Watching Cartoon Network or Nickelodeon on a Saturday and Sunday morning, eating cereal in front of the TV, that was the life back then. Not because I did not want Astro but mainly because my parents don't watch TV that often therefore they wouldn't invest in one. The best I could do was drop by a friend's house every weekend to watch cartoons together. However, things didn't really change that much. Even till recently, I had to drop by friend's house to catch up on Astro-On-Demand. Thankfully, there is Astro On The Go now. An extremely convenient and economical way to watch my favourite TV channels as I travel or even at home on my iPad or Samsung. So I've just came back from one of the Astro roadshows available throughout various campuses for students. There were plenty of games and prizes to be won including a whole month free subscription to Astro On The Go which can be obtained from the Lucky Draw. All I had to do was register on the spot to get 1 chance at it. It was pretty easy to get it too since most of us got it too! Simple games were played such as trying to kick and balance the ball multiple times. The winner will get a limited edition football from Astro, which was not inflated yet. There were plenty of people trying. Girls had to do a minimum of 3 kicks while guys had to do 10. Unfair! haha. Students registering for the Astro On The Go and the guy was really kind enough to walk them through the entire process. Also, there were plenty of freebies upon registration. Here is the best part. Astro On The Go has several channels for FREE, even if you are currently not subscribed to Astro. Just sign up here, www.onthego.astro.com.my. At the log in screen, you can only watch a selected amount of videos. Once logged in, you will be able to select from a wider range of channels, movies and videos. Just select the tab you desire on the left hand side. 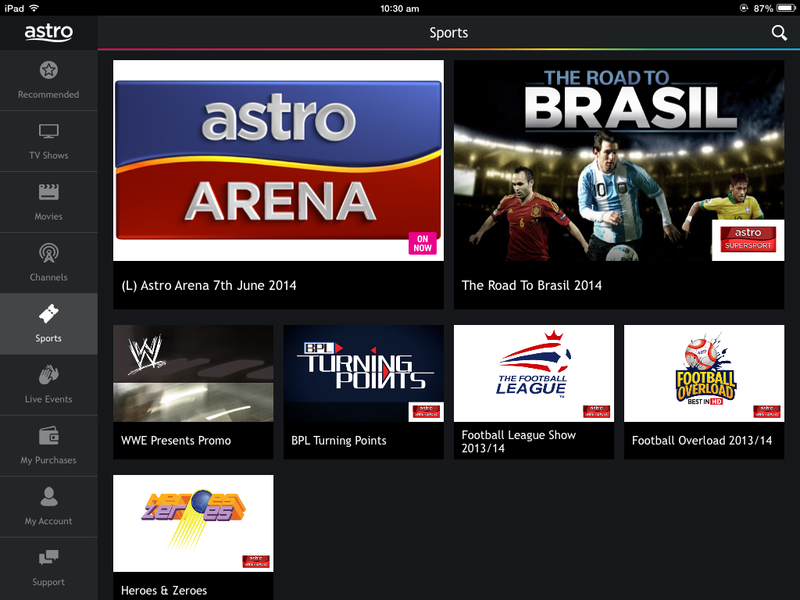 For existing Astro subscribers; Super Pack, Multiroom, Sports Pack & Value Pack, Astro On The Go is free! 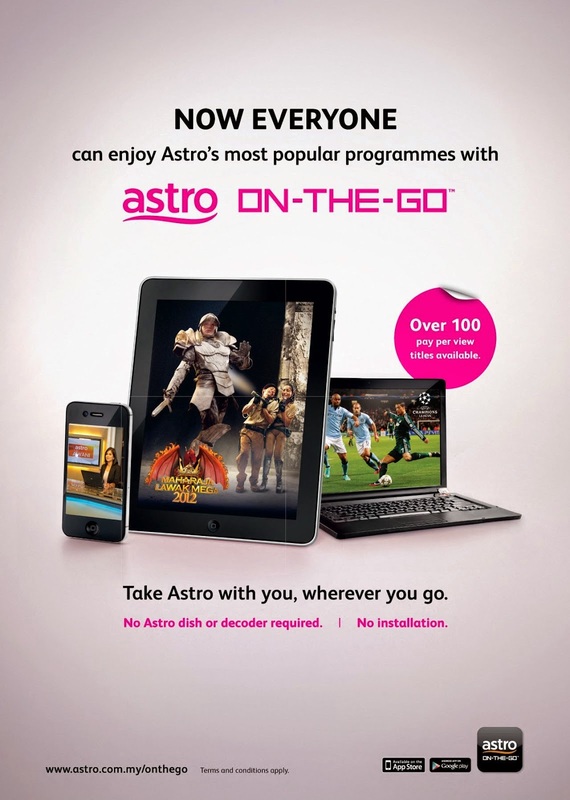 For Astro subscribers who are not subscribed to the above 4 package, an additional RM10 per month will get you access to Astro-On-The Go on your smart phone or tablet! Of course, there is another option of not paying RM10, but the channels available will be limited. For Non-Astro subscribers, here is the best part. Astro is available at only RM1 per day* , no installation or contract required. Just simply register, log in and subscribe to the channels (package) you desire. Its actually quite simple. For people like me, who do not have Astro at home. You can simply purchase the channels by logging in and selecting the channels you wish. Unfortunately, you will have to do it by browser and not the Apple or Android App. Apparently I still can't purchase the On-The-Go Pack from the App yet. But I'm sure they will fix it soon. Here are some of which you can purchase. And here I am, trying out one of their Korean dramas. Subtitles available for those who cannot understand Koreans, even though somewhat everyone tends to learn them now. There are also food series such as Masterchef Malaysia, Distant Shores and the ever so exciting, DC Cupcake Special! It really is enjoyable watching it on my bed.